I have a lot of reasons for preferring to bring my own lunch to work. Aside from the usual reason of it being cheaper, one major come on is the fact that I don’t have to step outside in the sweltering noontime heat to look for something to eat. So finding out about City Delivery definitely got me curious. Lazy people, rejoice! Food is a mouse click away. City Delivery is a third party delivery service that oversees deliveries for their partner restaurants that don’t usually offer deliveries. We’re not talking about fastfood and pizza joints that have their own delivery fleets here. City Delivery’s partners are mostly restaurants that are a bit more upscale or specialty restaurants that satisfy particular cravings. 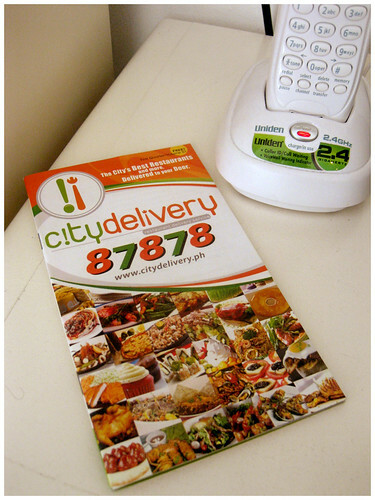 Going through City Delivery’s menu is an enticing activity, thanks to the varied partner list. Looking to feed a large group? There’s Blackbeard Seafood Island’s Boodle Feasts. Want to satisfy that sweet tooth? Grab some Cupcakes by Sonia. Hankering for handmade pizza? Dial them for Gourdo’s. Craving for Kaya toast? Ya Kun Kaya Toast is just a few clicks away. For those days when the internet is down. Happens to us on a daily basis. Thanks PLDT myDSL! Curious about how the service works (and attacked by a bad case of Mexican food cravings), I registered and tried ordering via their website. Signing up is a breeze and would probably be helpful in the long run for repeat orders. It feels much like your usual online shopping so I was in my element. I’m really not one for ordering on the phone. You just pick your food, stick it in the cart, then check out. You can choose to pay via cash or credit card – you just have to choose in advance, probably so their rider can bring their mobile POS (that credit card swipey thingie) with him. But then, since I had some questions, I ended up abandoning my online order and chose to order via phone instead. Connecting to their hotline (87878) was hassle-free. I didn’t get a busy signal and the call was answered in a few rings. Take note, I called during the lunch rush, around 12 noon. Ordering was easy and the person taking the call was pleasant. Midway through the call, I got cut off. They called me back within a minute, allowing us to pick up where we left off. Before we concluded my call, she gave me a time estimate (45 minutes) as well as their time, so we could synchronize our watches (so Parker Lewis, yes?). Satisfies the craving for online shopping, minus the long wait for shipping. Our order arrived a few minutes before the 45 minute estimate was over. My food arrived well packed and my tummy was happily satisfied. Overall, the ordering experience was pleasant, even for someone like me who refrains from ordering out. I like the online option as I don’t like talking on the phone, but even when you do have to call, it’s not as difficult as calling some restaurant hotlines. A few things to note though, their minimum purchase amount is 500 pesos. Not a big amount when you consider the average prices on their restaurant partners’ menus but still not your usual single person’s lunch, so it’s best to order as a group. There’s a delivery charge of 10% but then, that’s what most delivery services charge anyway. You can order ahead of time, so it’s also a good option if you’re in charge of ordering lunch or refreshments for meetings, or if you’re holding a dinner party at home. Heck, they even deliver drinks, playing cards and poker chips — perfect for instant poker nights, yes? 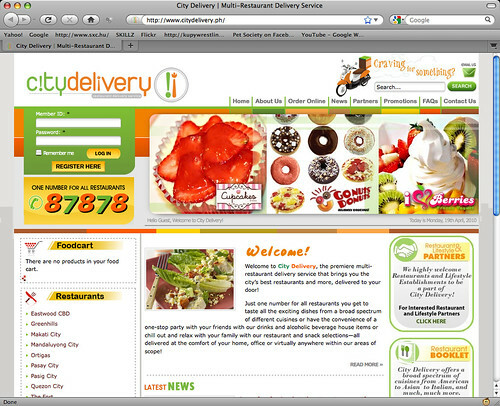 So, next time you can’t decide where to eat, surf on to http://www.citydelivery.ph and broaden your options. If you can’t go online regularly, menu booklets are also available at some of their partner restaurants. This entry was posted in link love and tagged city, city delivery, citydelivery, delivery, food, food delivery, makati, manila, ortigas, philippines, service. Bookmark the permalink. Wow, this is great! How I wish we have something like this in Cebu. thanks for the post/info, it is far more valuable than what i have found elsewhere online. 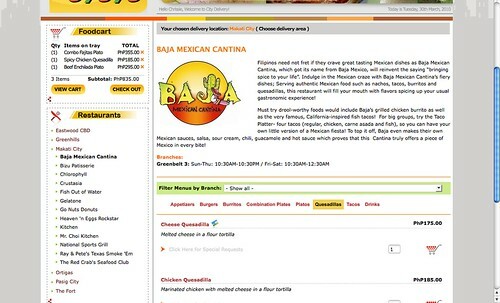 i have a general question regarding online food ordering: do you have any suggestions for someone in the USA who wishes to order meals for family in Manila on a fairly regular basis? i tried going the online gifts/grocery route, but the prices are ridiculous. i’d rather spend that kind of money on having ready-to-eat meals delivered to them, but i’m not sure which sites are safe and offer the best choice. thank you! Hi Clint. I’m not sure if any particular restaurant offers that. I remember the local Shakey’s franchise used to offer a similar service, but locally–that is, from one province to another. I think Goldilocks also tried going that route but my memory is fuzzy. I’m not sure if sites like this accept international orders. Citydelivery in particular, doesn’t since the payment isn’t done through the website. The transaction is finalized when the food is delivered. I’m really sorry, I can’t be of much help. Should I hear of a service that can answer your particular need, I’ll be sure to write you.